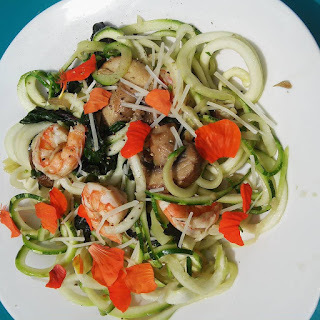 Zucchni noodles are great because the squash really has a light, green flavor raw, which is why we don't tend to love it outside of things that are terrible for us. Also, it has 5 calories per ounce to spaghetti's 45, and about 1/8th the carbs, double the calcium, and more than triple the potassium. It's a great substitute for dieters, because one thing that science has proven about weight loss is that lower carbs really do work, especially for the obese. Slightly warmed, it doesn't get gooey, and in cold "spaghetti" salads I actually like it better than the pasta! Holds some crunch. In a large pan, combine 1 tsp. butter with garlic and onion, cooking on medium until onion is slightly translucent. Bring beer to a boil, and toss in your shrimp. Immediately remove from heat and allow to basically poach in the pan until almost cooked through. Drain. This step isn't vital, and you can cook your shrimp in the pan with everything else, but beer brings out the sweetness and adds a bit of flavor, and it keeps the rest of the food from getting that cooked-meat slime on it, which isn't pretty. I used Electric Peel by Magic Hat Brewing today, because I thought it was absolutely horrific. But, it make a nice shrimp. Once the mushroom is cooked down, add the chard and wilt it good. Once that's done, add last of the butter and melt. Add in shrimp, and then zucchini noodles, tossing with tongs until thoroughly coated and warmed through. Seen here finished with nasturtium petals, which have a bit of that caper taste, Parmesan, and a profound amount of black pepper. People who like things salty might want a dash of something, but I really enjoyed the clean taste of the veggies through the buttery, fatty goodness without it. The petals are from my pesticide-free deck garden of edible flowers. Serves 2 at 239 calories a serving and is super filling. You could probably make this serve 3 if you weren't feeding say, my brothers, or lumberjacks.